* Macro Boy the Elder starts high school today. Your author still owns one or two ratty T-shirts from his first year of high school, which it occurred to him that he's owned for 2/3 of his life. Whether his inability to throw away an oh-so-comfortable "Warrior Baseball" shirt says more about his age or his fashion sense is left to the reader. * Macro Man updated his monthly equity models, and despite his scepticism the bullish tone keeps on truckin'. While he has discussed in the past why the current magnitude of bullishness should absolutely not be taken at face value (given the distortions caused by ultra-low yield levels), the fact is that that current model recommendation is for a healthy long position. * At least the recent uptick in the forecast is grounded in something other than the great black iron cauldron of swirling central bank liquidity. 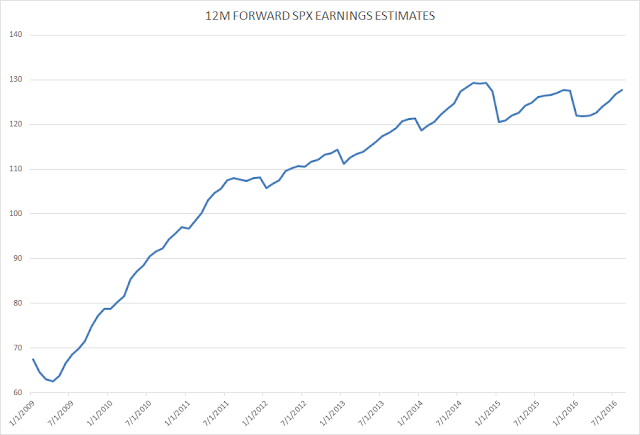 12 month forward earnings expectations have turned up again and are now higher than at any point since 2014. 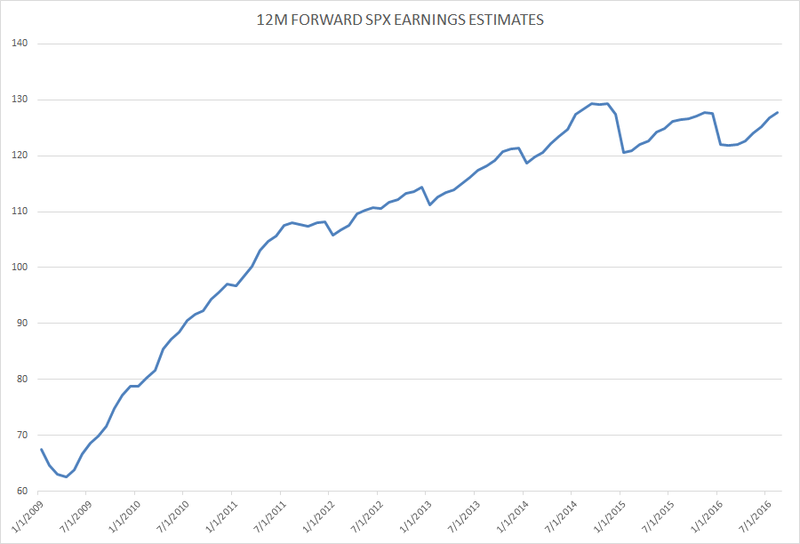 While this is not quite the same as having actual earnings deliver the same trajectory, it still beats the aggressive markdowns observed a couple of times over the last two years. * One sector that's taken a beating recently has been the gold miners, with Macro Man's old standard GDX coming under the cosh. The miners have weakened somewhat more than might be expected given price action in gold; the heavy volume of recent days is certainly suggestive of longs ringing the register (or hitting their stop out, depending on when they bought.) Macro Man still has a decent position in this; to date, positions in other markets (rates, FX) have not kept up with the carnage in the miners. If these relationships to not re-assert themselves soon, he may look to trim a bit. Struggling to understand you still hold GDX. Think the double top fail tells us this is not a dip correction in the short term. From here the likelihood is a squeeze establishing a large consolidation range ,or a failed squeeze of unknown magnitude that resolves into a clear downtrend. Probably the least likely is to make a new high invalidating the DT unless of course the Fed decides to shift it's dot plot to a different planet. Does that really look likely at this point. If that Aud/NZ would just drop a bit more I could fancy that for a decent trade ,but it looks too early here so I will stick with the GBP/EUR for the moment. Still think this is due rally strongly. GBP has had it's pol moment plus Carney double down and it still couldn't make headway when Hedgies are all in soooo crowd squeeze on any of the future raft of 'bad' pol EU news looks worthy of a trade. Starting with Merkel going down in flames this weekend. Time the world woke up to the fact anti EU sentiment isn't a UK phenomena so maybe they're looking in the wrong place for political risk. Easiest trade in the world: wait for Yen to strengthen and then BOJ to start selling Yen every day and the carry trade levitate equities. Free money !!!!!!!!!!!!!! Strongest MoM bounce in manufacturing PMI in 25yrs. This certainly messes with my plan a little as I was getting ready to short the euro against the pound heading into this weekend following NFP. Lots of internal polls looking very shaky for CDU. Even if CDU squeaks by, it should still be euro negative. Well if they dont? I think EUR/GBP gives up half of its Brexit gains over the next few weeks. I have no idea how you even get that shirt on, MM. LB has gained 25-30 pounds since his matriculation (10-15kg for those who haven't exited the EU). Rite of passage, MM, pretty soon Macro Boy the Elder will be experimenting with beer and birds. We like to scour the media for signs of tops and bottoms here. Wonder if this indicates trouble ahead for REIT longs? Although the arguments for holding REITs are strong (lower for longer has proved to be correct), LB is worried that all kinds of normally clueless punters have recently come around to holding this opinion. Could Tantrum Two be in the immediate future? We like REITs a lot but have found that the key to making money is to only buy at fire sale prices, and to lighten up when everyone and their uncle starts to fancy some 8-10% yield. [We are long NLY, AGNC common and preferreds, among others, but are hedged by being short IYR}. Consensus for Friday now at 185,000. but the whisper number is a little warmer at 215k. LB suspects that the Fed doesn't want to miss yet another window of opportunity, and so Yellen actually does plan to hike in September unless there is some unforeseen event between now and then. Only a horribly soft jobs (and wage growth) number would deter them here and the initial claims data just doesn't give any hint of that. Traders probably aren't in agreement with this view, however, and are still leaning towards December, with 200k being the headline number that divides the bulls and bears. If we are correct, then anything north of 200k should lead to another leg higher for the dollar as September becomes more probable and yet another group of USD shorts are going to get squeezed. A consensus number would lead to a short-term fall in USD. 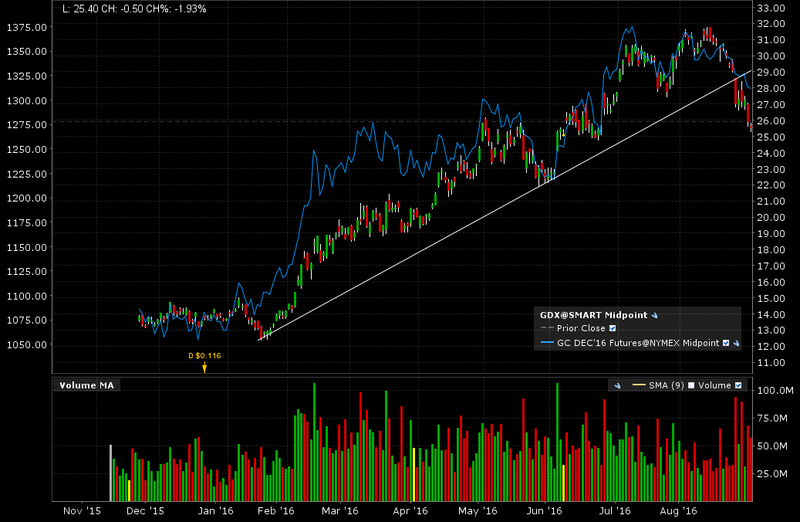 Btw, MM, GDX chart is broken, and much gappage still lurks down below. We have been short this since about 30, so it's time to take some off the table for us today, as GDX has pierced the lower Bolly band a few times of late. Still, from the technical perspective you'd have to say a rally to the 50 day would be the best case, while another steep drop isn't out of the question? LB is off to Berlin today, a good place to watch German political developments and their aftermath. The one commonality between electorates worldwide seems to be a fear of large scale immigration and consequent political instability, and LB expects that the Germans will prove to be no exception. Mutti has made some serious errors and is about to be reminded of the need to stay aware of public opinion. Politicians and other elites seem to always underestimate the effects of immigration waves, perhaps b/c it is all so abstract to them in their gated communities and ivory towers. One more observation on CADUSD and crude oil, which are falling hand in hand this week and threaten to move lower today or tomorrow. CADUSD is looking at a possible break of support at 0.7600 while CLV6 is sitting atop the 200 day average here at around $44.50. With oil prices staying stubbornly low and Vancouver housing bubble reportedly popping, CADUSD remains our favorite FX pair to short as there is a bit of an air pocket below 0.7600. This was below 0.6900 in January, remember? You called that Can/USD and at the time I didn't like it. I like it a lot more now and a later entry is still better than no entry with the dollar policy perched where it is. when the upcoming moove is dollar strenght a good nfp produces the last push before reversal far more often than anything durable, in case of a bad number I'd asume this last push to be delayed. No way I would want to be long USD here. 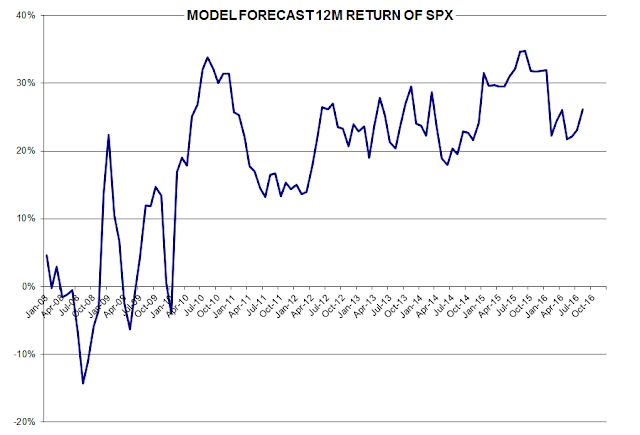 There is a high chance that ISM will be disappointing or NFP will miss. And if either of those doesn't occur, I think Yellen will find some other excuse not to hike in Sept. But the real reason will be the election. December is a different matter. The market may have priced it in and may look beyond it, but I doubt that. So the question is whether to start to fade dollar strength now, after ISM, after NFP or sit it out completely. Rather than dollar plays, I think it is better to sit it out or play other crosses. Nzd pairs look interesting and the NZD is starting to get to an interesting level of relative overvaluation. Booger said: "No way I would want to be long USD here. There is a high chance that ISM will be disappointing or NFP will miss. And if either of those doesn't occur, I think Yellen will find some other excuse not to hike in Sept. But the real reason will be the election. December is a different matter. The market may have priced it in and may look beyond it, but I doubt that." "So the question is whether to start to fade dollar strength now, after ISM, after NFP or sit it out completely. " This is certainly pertinent. LB is strongly inclined to sit it out completely, with the exception of a few clearly defined lottery tickets. Upside risk in the USD is largely overlooked here, and so taking a punt on a spike higher is extremely cheap. That's what today is about, mulling the risk/reward that is out there. LB, yep the hammock looks attractive especially as far as dollar plays go here. I tend to think the short term upside risk for the dollar is lower than you probably do. It could happen, but that would rely on the Fed actually hiking in Sept. The imputed probability is 30% so they are unlikely to let it go much higher, unless they actually want to hike. My premise is still that they won't hike due to the politics of it. A Clinton win is expected by everyone now, as you suggest. But a rate hike in Sept would be a slap in the face to the incumbent party/Clinton and is really not necessary. I mean they have not raised all year so what would be the rush to have to raise in Sept and have a grudge against an incoming president ? Especially when it would be just as easy and make no real difference to hike in December instead. In which case, if ISM is weak and Spoos is weak, they will take away rate hike talk and everyone is happy clappy again, even Clinton, who will think Dame has been a genius for pulling out the rate hike talk to push it away at the opportune moment just to save spoos just before the election. Hoorah ! What will be interesting is how they back out the rate hike talk if ISM is a scorcher and NFP is a blowout. That would be a difficulty. But I reckon they had a look under the hood already last weak and had a hint that ISM and NFP would be fizzlers and so could cart out the rate hike talk body for a week safely. Ah, there I got the conspiracy theory off my chest. Who are these people? It gets scarier by the day. Mr. Hilsenrath: What kind of compromise would it take to get the FOMC to move in September? I mean, so the tradition is there’s some kind of — like you say, some kind of agreement. What would it take to get them there? Mr. Bullard: Well, I have no idea, so — and it’s really — it’s really the chair’s job to fashion that. But I will say that — I’ll talk historically about the FOMC, the kinds of things that the FOMC would do. You would trade off. You would say, OK, we could hike today, but then we’ll not plan to do anything in the future. That would be one way to — one way to go about a consensus. So that often happens on the FOMC. Or vice versa. If you read the Greenspan-era transcripts, he’ll do things like, OK, we won’t go today, but we’ll kind of hint that we’re pretty sure we’re going to go next time. Mr. Bullard: And so you get this inter-tempo kind of trade-off, and that often — that often is enough to get people to sign up. Mr. Hilsenrath: So, hike today and then delay. Mr. Hilsenrath: Or, no hike today and then no more delay. Mr. Hilsenrath: Something like that. Mr. Bullard: Yeah, those kinds of trade-offs are, historically speaking — I’m not saying I know what Janet’s doing, because I don’t. But, historically speaking, those are the kinds of things that the FOMC has done. Mr. Bullard: Those are great. That’s worthy of a T-shirt. (Laughs, laughter.) You could have one on the front and one on the back. Ms. Torry: Or a headline. Mr. Hilsenrath: Well, that’s the St. Louis framework now, right? Mr. Hilsenrath: Hike today and then delay. Mr. Bullard: Yeah. That’s what it would be, yeah. Mr. Hilsenrath: But if you decide to use that, maybe you can credit — you know, include a little footnote to the Wall Street Journal. Crude is breaking down again, CLV6 broke below $44.50. At some point this will "matter" to markets…. U.S. crude oil stocks increased by 2.3 million barrels to 526 million barrels in the week to Aug. 26, data from the Department of Energy’s Energy Information Administration showed. Analysts had forecast an increase of 921,000 barrels. “The high U.S. inventory data suggest oversupply will remain for longer than expected. On top of that, anticipation of a higher dollar if the Fed starts to hike rates is negative for oil prices. And there’s also uncertainty about the likelihood of OPEC/non-OPEC action at the end of the month," said Hans van Cleef, senior energy economist at ABN AMRO Bank N.V. in Amsterdam. “There is still lots of correction potential, given the overhang of speculative long positions and exaggerated hopes for an output freeze,” said Commerzbank oil analyst Carsten Fritsch. on crude: anecdotal evidence that the Chinese may end their SPR filling sometime soon, which means a daily demand of well over 1mio bbls/day will disappear. This SPR filling (in China) has been rather supportive of crude since that dump under 30 in Q1-'16. LB, bit confused about your REIT trade. Long the mortgage REITs and short index to hedge? Mortgage REITs make money on spread between short and long, so not sure rate hike helps them and may hurt them. The index, which mainly has property or equity REITs will be hurt by rate hike (except for lodging REITs that are already in cellar). So on surface your move seems to work better if you think there will be no hike. What am I missing? wow that was a horrible print in ISM. new orders collapsed (though the new orders series is more volatile) and we are at a point where historically new orders usually bounce, if not go lower its usually a sign of recession. Jamie Dimon buying JPM marked the bottom for equities earlier in the year. Tim Cook selling Apple mark the top? So, if there is a big miss in NFP tomorrow, will equities sell off in anticipation of poor earnings/recession, or rally in anticipation of no rate hikes in the near future? Nico, you are the master of short. Interesting morning. LB trimmed a bunch of strong dollar trades between 9.30 and 10 (short AUD, CAD, EUR, GDX, TLT), but kept a few UUP calls as a lottery ticket, and stayed modestly short equities (IWM, QQQ). For a little while one of our concerns has been what might happen if there was an unexpected rally in JPY, and we are still keeping half an eye open for that. A while back, Team Macro Man (Polemic, MM and cpmppi) coined the Rule of ISMs, which states that the Fed never tightens after an ISM drops into recessionary territory. After this morning's number we would have to have a rethink. For now, we are going to remain in the Hammock, observe the rule of ISMs and wonder whether a September hike is possible, even if tomorrow's number is strong…. Agree btw with NicoG about Price Is News. Yes folks, equities can trade lower, in spite of or even because of, a weaker number tomorrow. We would all be advised to remember that equities can sell off, just because equities are selling off. @Flowthrough - mREITS are weird in that while they 'should' respond to the same dynamics as financials (atleast those financials that do retail or commercial lending as opposed to I banking), because their interest rate hedging practices make their metrics rather opaque, their correlations are better with the REITs and utilities as a whole probably because they are not very well understood - obv you can think of that dynamic both as an opportunity or a risk. @Nico first interesting day in forever, but I half expect a stick save any second followed by the smug appearance of sigma and 12Yo - thats just what this market has conditioned everyone for - I guess we will find out soon enough if the record spec length in spoos and nasdaq have any relevance. The rule of ISMs would make Fischer and the Fed lose further credibility, which is like saying elephant poachers would look worse if they also started murdering zebras. I think that too much focus had been on tomorrow's number so I would rather not spend too much capital on that lottery, so trimming my shorts and buying some beaten-down stocks as insurance. And SP has only dropped 30 points so it is hardly a correction for now. But Nico is correct that between now and the end of the year, shorting should have a much better reward/risk ratio. The short crude call has been spot on. Noticed that XLE has only dropped 4-5% whereas WTI has dropped about 10% from its August high. Is this because equity punters are still pricing in a $60/bbl target by Year-End (sounds familiar...) and hence are slow to react? A short term VIX might also be a good way to play whatever happens tomorrow. Downside is quite limited, while if NFP turns out to be a blockbuster (as in LB's case before the release of ISMs or ADP) the shock to equities will result in a good payoff. Having a decent run since Jackson Hole. Cut +USDJPY just head of ISM. Took off +EURGBP before CBI #s, but didn't flip (mind not flexible enough) to -EURGBP until yesterday. Covered now and watching. Interesting that riskies have aren't moving in that pair ... the GBP-longs have some nerve while JPY-longs looking a bit nervous. Also covered short in GCZ6 (today) and EDZ7 (Sunday). Stopped in AUDNZD (part Tue, part Wed), EURSEK (Mon) in the past days. Leaves me pretty flat now going into NFP. Still long Nov FXI calls and short HGZ6. Positioning in GBP, JPY, and gold has me focused on those markets for signs of a shift. A bloomberg article pointing out CNY has broken out (barely) of downtrend against CFETS basket. Could be beginning of a pause until G20, or SDR inclusion in Oct, by which time shorting CNY may be worth another go. johno - curious how you are structuring a CNY vs CFETS trade - are you basically just doing it vs the dollar on something like IB? or using actual weights? "Apple to repatriate overseas cash pile next year, says Cook"
Empty threat. It will never happen. VIX is actually juiced here with NFP coming Friday. Not going to move much higher without MKT beat down. Never get long VIX with a steep contango board. Never. Ever. washed -- just wanted to add, I would not use IB for this. CNH financing rate is CNH HIBOR overnight fixing rate + 5%, i.e. 6.4%. CNH really has to move for the trade to work, and if CNH did really move, the PBOC could engineer a liquidity squeeze as it earlier this year (I seem to recall >100% overnight rates). So I'd look to do a forward. My thought is that after a pause, CNH could resume gradual depreciation for some time. USDCNH 12-month forwards imply just under 2% depreciation now, way down from earlier this year. Depending on my view on USD, I could then sell USD against the basket. Disclaimer: my views, especially at longer horizons are generally rubbish! Keith's mum was especially fond of Lula and was long Petrobras.